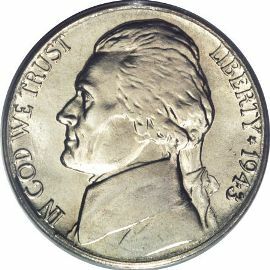 Silver Nickels were produced at the beginning of World War II. Certain metals were being rationed due to war efforts. Nickel was very highly valued for use in armor plating on tanks. Congress ordered the removal of nickel from this denomination, effective October 8, 1942. From then until the end of 1945, five-cent pieces have the regular design but were minted from an alloy of copper, silver and manganese. the portrait and "LIBERTY" along with the date on the right. 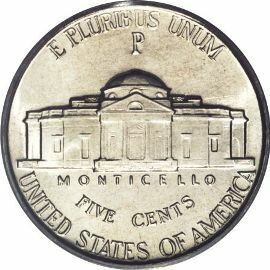 The reverse of this coin has a picture of Jefferson's home with the name MONTICELLO under it along with the denomination and the inscription "UNITED STATES OF AMERICA". Directly above the dome on MONTICELLO lies the mintmark for the coins dates from 1942 to 1945, which makes these coins unmistakable as wartime issues.